The Corbett administration is fighting to conceal state documents that show what a handful of public officials did while serving on Penn State’s Board of Trustees. Calling it “ridiculous” to have to release records of so-called “ex-officio” board members, Corbett attorneys last month asked the Commonwealth Court to let it keep records of the governor and secretary of education under wraps. Ordering the release of trustee records in the possession of the Department of Education would be “exploiting the circumstance of a public official serving ex officio on the Board of Trustees,” wrote Pennsylvania General Counsel James D. Schultz in a March 28 court filing. “Such a blatant disregard of PSU’s rights would expose PSU’s records to public scrutiny,” he said. Schultz is the governor’s chief legal advisor. He’s also leading Pennsylvania’s lawsuit against the NCAA. The dispute involves a Right-to-Know Law request by Penn State alumnus Ryan Bagwell that sought documents sent to Secretary of Education Ron Tomalis in his capacity as a Penn State board member. The Department of Education denied most of his request, and the state’s Office of Open Records ruled Tomalis’ trustee records are off limits. But Bagwell appealed the ruling in November, arguing that records of a state agency are public records regardless of how they made their way into the state’s hands. “If Governor Corbett was serious about making Penn State more transparent, he’d tell his lawyer to stop helping it conceal university records,” Bagwell said. The Corbett administration’s arguments are contrary to his calls for Penn State to become more transparent. Last year, Corbett said Penn State and its sister state-related universities should have to comply with all provisions of the Pennsylvania Right-to-Know Law in order to receive state funding, according to the Harrisburg Patriot-News. But Schultz argued the RTKL shouldn’t be “twisted into (a) mutant weapon” that would force the governor to release his trustee records. Penn State could have intervened in the dispute. But it stayed out of the case, and let Corbett argue on its behalf. Oral arguments are tentatively scheduled for June 17. A decision is expected sometime in the fall. Would someone explain to me how this man is wearing a $4000 suit & living in the governor’s mansion instead of donning a prison uniform & residing at Graterford? Between the money laundering, Act 13, allowing Sandusky to continue to adopt children when he’s a “person of interest” in an ongoing abuse investigation, his illegal attempt to sell the lottery-and the list goes on & on. Sounds like somebody’s trying to hide something! 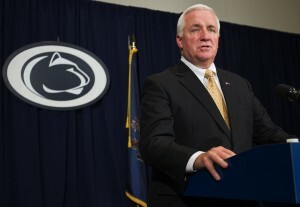 Wondering if Corbett’s NCAA lawsuit is all just a ploy to appease the mob coming after him. If that suit ends up forever delayed like the Curley/Schultz/Spannier trials, I will be convinced that its all a distraction. Gee, I hope it’s not some kind of slimy deal by Corbett.